When it comes to gutters, we have you covered! 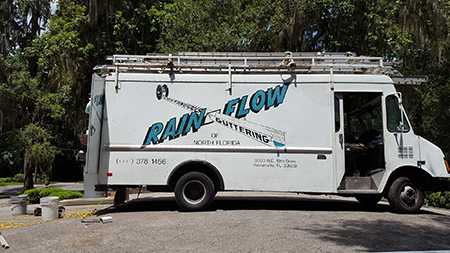 Established in 1973, Rain-Flow of North Florida, Inc. is the oldest gutter company in Gainesville, and we continue to be the area’s go-to source for residential and commercial gutter services. Our experienced team can replace, install or repair all types of gutters, completing projects big and small, for residential and commercial customers. Our company is locally-owned and -operated, established in 1973. Our team is fully licensed and insured, assuring excellence on every job. We are the oldest gutter company in Gainesville, FL. Put our experience to the test! We specialize in both residential and commercial gutter services. Rain-Flow of North Florida, Inc. is your premier service provider for gutters in Gainesville, FL. We specialize in all styles of gutters and accessories, including downspouts, seamless gutters, underground piping and leaf guards. Our experienced team can replace, repair or install all types of gutters for your residential or commercial setting. We offer more than 30 colors and all shapes and sizes to create the ideal gutter and drainage system for your property! We start the process with a free estimate and finish with your complete satisfaction, guaranteed. Our commitment to service excellence is the reason we have so many repeat customers and are considered experts in our field. Fully licensed and insured, Rain-Flow of North Florida, Inc. is dedicated to delivering fast, efficient service that gets the job done right, the first time. When you contact our office, a knowledgeable team member is available to answer all your questions. When you schedule an appointment, we perform your free estimate at your location, and we can even take care of some calls the same day! It’s easy to see why we’re the leading source for gutter installation in Gainesville, FL. Check out our Facebook page to view our ongoing projects. You’ll get a taste of the impeccable results produced by our team and see firsthand our dedication to your satisfaction. Contact Rain-Flow of North Florida, Inc. today for top expertise in gutter installation, repair and replacement for your home or business.